DISCLAIMER: Aftermath is a book that is crucial in this current world. It shows a new perspective on these horrible school shootings, the family of someone who participated in a school shooting. The main character is the sister, and so because of her connection to the shooter, is condemned shamelessly by society despite her innocence. Please do not write this book off as a shooter sympathetic book because I assure you it does not see violence in a sympathetic light. This book is amazing, and extremely relevant. It shows two different perspectives, both people who lost a family member during a school shooting, but in different ways. Skye is heartbroken, still struggling with guilt and trying to not feel her brother's loss while Jesse completely changed after his brother died still feeling angry and betrayed by Skye. While all this is going on, there is a chilling mystery that slowly uncovers itself throughout the book, leaving the reader shocked and with a new perspective. I think what I most liked about this book, is that it sheds light on so many different, and often overlooked issues at the same time. 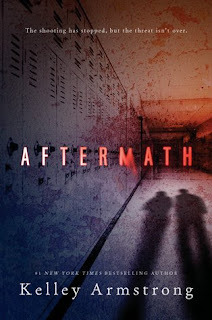 It tackles grief, depression, guilt, bullying, and most importantly the school shootings. This book will touch the hearts of many people who need to know what is going on from the perspective of someone living through this, instead of just someone reporting on the news screen. *Thanks to Penguin Random House for sending us a copy for honest review.